Iceland’s Capital, Reykjavik, is the smallest and perhaps most charming capital city I’ve been to so far! Very much like a Scandinavian town, the style of the buildings are comforting and you know that you are 100% safe when walking around this city, even in the dead of night (it’s one of the safest countries in the world). This is a place I had wanted to get to for years, and with limited time I had to make do with 48 hours and 30 minutes in the country. Not nearly as much as required to see the whole country, but long enough to hit the 3 most popular attractions and try some of the local delicacies! My first recommendation is to hit the Blue Lagoon on the way from the airport. All the airport buses to the city stop here on the way in, so you can hop off and back on easily with your ticket! If you fly in late at night though don’t panic, as you can always hit the blue lagoon on your way back home. For those of you who are slightly confused by what this lagoon thing I’m going on about is, it’s a geothermal spa that is a must visit if you enjoy a good relax and wish to cover yourself in silica mud (good for the skin, like a chocolate bar is good for the spirit). When looking for accommodation in Reykjavik, you can find everything from budget hostels to luxury hotels all fit into the charming city style - literally nothing looks out of place here (of what I saw anyway!). From our backpacker accommodation at the Bus Hostel, all the way to the most luxurious hotel, such as KeaHotel, there is a bed for one and all. Keep in mind though, as you may have heard, Iceland is on the more expensive side so you’re not going to get as much for your dollar. A hostel bed will cost between £15-£25/night, and a hotel room starting from £75 - so more than your average city break but less than you may expect! The next step is finding dishes to eat! Iceland has many traditional dishes, some absolutely delicious and others that, I’m sure are lovely, but not my cup of tea… From Hangikjöt (Smoked Lamb) and Kjötsúpa (Meat soup), then the delights of “Ein með öllu” - the iconic Icelandic hot dog all the way to perhaps the less tempting Hákarl (Cured Shark) or Svið (Singed and boiled Sheep Head). I’ll let you decide what your favourite is when you visit! I have to say though, the meat soup was super. If you’re a fan of burgers though, there are so many american style burger bars which are cheap and delicious. These guys seriously know their way around a cooking a cow! You can post your letters to Santa here too! As in any city, a walking tour is in order and it’s worth checking out Hallgrimskirkja Church - the really big building that looks like a cathedral for those of you who are easily confused! My other favourites were The Pearl, The Old Harbour and Imagine Peace Tower. Each of these are major points of pride to the Icelandic people and I loved being told all about them by the locals. If you can, hook up with CityWalk - run completely on donations and the place to be if you want to learn all about the staple sites of Reykjavik! From Reykjavik, you can access a world of adventures and tours, from the Golden Circle and the Northern Lights, to Icelandic Horse Racing, Glacier Hikes and even diving between the two divergent tectonic plates! Once again, keep in mind that Iceland isn’t a cheap place to experience new adventures but with a list starting with the above, how could you resist! Check out Reykjavik Excursions website for a more thorough list of all the activities to try - there really are hundreds. For gifts & souvenirs to take home, you have a huge range to choose from! If you’re a fan of the dreaded C word (Christmas guys), then you will find a huge selection at the festive shops open all year round, my travel buddy and photographer Rosie absolutely loved the hanging decorations she found. You may also like the Icelandic Volcanic salts (for cooking, not bath salts - I got very confused at first). As you can imagine, the salt is completely black but we were told it tastes great when cooked on lamb - I’ll let you be the judge if you are bold enough to try some. You can also grab some of the delicious Icelandic chocolate, I know it’s not somewhere that comes to mind when you think of chocolate delights but it really should be! If you really love someone, you can splurge and instead of the typical magnet / keyring combo buy them an Icelandic Jumper. These are pretty pricey but you can find some gorgeous and snuggy ones all down the main street of Reykjavik. Finally, I have to mention Konsull Cafe and Bar. If you can get here you must have a coffee and a slice of cake. After a long day exploring we hit this cosy little shop and enjoyed the most delicious warm drinks you can imagine while in an old fashioned charming setting. So, if you’re heading to Iceland and staying in Reykjavik for a portion of your trip I hope this has helped give you a little! I wish I had longer here and had managed to hire a car to explore the island a little further with, as there are so many towns, waterfalls and incredible scenery to check out. Please let me know if the comments if I’ve missed anything major and if you want a more compact idea on Iceland, check out my Two Minute Guide to Iceland. The Northern Lights are on most people’s bucket lists these days, and are truly an incredible natural phenomenon. I finally hit Iceland with the goal of watching the lights dance above my head in it’s stunning green, red and blue hues - the land of fire and ice did not disappoint. Otherwise known as the Aurora Borealis, the bright colours can be seen around both the North & South Poles and is caused by the sun’s radiation. Commonly seen in the northern hemisphere in Arctic countries such as Norway, Finland, Alaska, Iceland and many more. They are also very occasionally seen further south, and I’ve even seen them once in Bath (Southern England) which is super rare! It’s only possible to see them at night as the lights aren’t strong enough to be seen in the daylight but are still going on - similar to how we can’t see stars during the day! When I was in Iceland, I hooked up with Reykjavik Excursions who took us out on their Northern Lights tour. They use all the sciencey knowledge to monitor where the lights are most likely to be seen each night and, as long as there is a chance for a clear sky somewhere in Iceland they take groups out to stand and look up at the night sky. It’s a minimum of a 30 minute bus ride to get out of the city and away from the light pollution. While the lights can be bright, they’re sometimes We stood and stared at the milky way, which was truly spectacular - I wish I could have got you some photos but they didn’t come out unfortunately without enough light! I have no idea how long we waited under those stars, but it was long enough for most people to head back into the warm bus, and for me to find a patch of moss to lay down on to get a better view. Eventually though, we saw something slowly getting brighter in the sky and after a few excited hollers, it was clear that this was what we came to see! My travel buddy and photographer literally pulled me up and we ran over the rocks to get the best position far from the buses on the top of this volcanic mountain in the icy air. The lights went from a very pale ribbon in the sky getting brighter and brighter until they were dancing in reds and greens above us, moving through the sky and was truly better than I could have imagined. I’m not ashamed to say I was completely in awe and even shed a little tear (This isn’t a big deal for me though because I will cry at a good advert on TV if there is a slightly emotional aspect to it).The pictures say a thousand words so I’ve put them in below - they had to be taken on a SLR to allow for a very long shutter speed to capture the light. All I can say is they are amazing and you need to see them for yourselves! Now, obviously the Northern Lights have been happening long before we started tracking it or even understood the so there was a look of folklore and stories about what they were! Some believed they meant grave danger was on the way, and would carry a knife with them when the lights were on show to protect themselves. Others believed it was the spirits of children who died or were stillborn dancing in the sky above them! If you’re interested in some of the many stories, check them out here! Because Iceland is known for the midnight sun through summer, and is dark 90% of the day during the winter so if you want to see the lights it’s pretty obvious you need to go between September - April. It’s also cold these times of year, so take a lot of warm layers, hats and scarfs as you’ll need to stand in the cold and be patient for a while, these lights don’t have an on/off switch and will appear and disappear without warning! My super excited face after seeing the lights! I cannot thank Reykjavik Excursions enough for the way they ensured we all saw the lights, and it’s their policy is to let you on the tour again for free if you don’t see the lights or if they have to cancel due to bad weather so you won’t be out of pocket. Make sure you get out to Iceland and see them for yourselves - take it from me you definitely won’t regret it! I love a good bit of relaxation and pampering as much as the next person, and I can tell you that the Blue Lagoon did not disappoint! The Blue Lagoon is actually a failed power plant, which is a little amusing considering that it’s now one of the most famed Geothermal Spas in the world! Located in Grindavik Lava field about 15 minutes drive from the international airport, it’s one of the most popular tourist attractions in the country! In Iceland, they create electricity by pumping water through rock which is super heated by geothermal activity then shoots back out as steam running the turbines and generating power. When they created the blue lagoon, this was the plan however when pumping the water through the volcanic rock, the natural silica in the water clogged the holes within the porous and caused the water to start filling the lagoon area as it couldn’t flow down. They rebuilt the power plant very nearby and managed to run this efficiently despite complications with the blue lagoon site with the water pumped up from here being used in the lagoon. For anyone curious as to why I actually know something about this, I studied Geology for two years at A Level so this is something I really enjoy! The silica and sulfur causes the water to be the stunning blue colour, and is also known to help people suffering from skin diseases such as psoriasis. The silica combines to form a clay like mud which is used by all bathers and rubbed on your skin like a mud mask! If you walk towards the far right of the lagoon, the mud is thick on the ground and you’ll be walking through it while in the water but if that creeps you out most of the lagoon is lined with volcanic stones. If you’re feeling like really pampering yourself, you can book a massage where they will lay you down and rub the silicon mud all over you while you simply relax above the 37-39 degree water! Now while I hate to break the illusion, the lagoon structure is man made BUT the water and all the minerals within are 100% natural. They’ve even developed a skincare range so you can take these ‘super-powered’ minerals home with you to keep your skin refreshed! However, if you’d rather have a few drinks and have a laugh with good friends while soaking in the scenery around not to worry! The lagoon has a bar build in serving everything from healthy smoothies to sparkling wines and beers. The changing rooms are rather small, and if you don’t like getting naked for all to see don’t panic as there are a couple private rooms to change in within the main changing room area, and a few toilets to sneak into. You also get a small locker for your valuables and changing clothes here so not to panic about leaving them far away in the luggage store. If you’re bothered by dirty showers though don’t fear, these are pristine and are constantly cleaned so ensure everyone can change and dress in peace without stepping in other people’s hair while trying to wash their own. Speaking of hair, if you have long locks like me, you want to whack it up into the highest top knot you can imagine. The water can play havoc with your hair and tangle it up due to all those volcanic minerals so make sure it’s tied away or you run conditioner through it without washing it out just beforehand (conditioner is provided by the lagoon and is complimentary). To make a day of it, you can grab lunch in the restaurant on site by booking a table in advance and hop back into the lagoon after. From steam rooms to saunas that are also included, there is no way you’re not going to enjoy a few hours soaking away here! Don't worry about your valuables while at the Blue Lagoon, you have two options to keep everything safe. Firstly you can lock your suitcase away on arrival to the car park, this costs around 3 euros and the are stored with attendants to watch over them. For your smaller valuables all the changing rooms have lockers which you can store a small backpack with your clothes and all those expensive knick-knacks inside worry free! This is my ode to the Traditional English Pub. As I sit in an armchair in a beautiful public house waiting for my grandparents to arrive, I can't help but appreciate just how special they are. An English pub is usually the oldest building found in a village or town after a church (you now know traditional British priorities) Every village would have had it’s own pub, and these buildings would be filled with men after a hard day work, drinking and smoking by the fire. Today, they’re slightly more conservative (unless you live in my village). Most pubs will have a dinner and lunch menu to bring in the punters, people will travel far and wide to reach traditional pubs that serve good food. But the buildings are as they have stood for hundreds of years, with old wooden beams lining the ceiling, strong wooden doors and open fireplaces. Some even have a ‘horse park’ remaining, so that the gentlemen of the past could ride by the pub, or leave their horse to rest after a hunt. It was, and still is, the centre of community life in small towns and villages throughout the British isles. Pubs in Britain date back to 42AD, and have survived through a number of invasions throughout the last 2000 years. While that may all have changed, one thing stays the same in any local pub - there will always be that one lonely person propping themselves up on the bar talking to whoever will listen about XYZ. My local pub is a quintessential English pub, complete with log roaring fires, wooden beams, west country cask ale and delicious meals made with local produce. The best part of our local is that it is a local, by that I mean that many pubs are owned as chains now, offering good food and service but it's not nearly as intimate. Our pub owner knows us all and our parents, and when we were young would know where to send us home to if we drank too much! They run first Thursday of the month for the gents and a skittle night for the ladies so really still is the heart of the village. Around 500 years ago, the inns, alehouses and taverns began being collectively referred to as the public house, with there being one pub for every 200 people throughout England and Wales! While at the time, the bar would be split into different rooms so that the different classes would not mix however these walls have since been removed. It cam give a lovely atmosphere today though, with lots of nooks and crannies to hide in to enjoy a private meal or drink. It is even said that one in four will meet their future husband or wife in a pub as did my great auntie and uncle Buck! These buildings are the last reminders of an old age, the times that Downton Abbey has taken us all back to. While the aristocracy has very much changed, the traditions and estates of the past now turned into hotels and National Trust properties, the local pub still stands and I think there is something quite poetic about this. It’s almost the last place that the younger generation will sit and enjoy the history of our country. And, if you’re reading this in America, the local pub in my village is a few hundred years older than your country! Pag Island is becoming more and more popular for tourists to visit, and it's probably down to the party town of Novalja. This has recently been likened to the Ibiza of Croatia and having been I can understand the likeness. Although the differences are vast (Ibiza costing on average of €90 to enter a super club and in many places there being a dress code unlike on Zrce Beach, the main party strip in Novalja, it’s free entry and flipflops were ok), I would say the atmosphere is the same - it’s electric and seriously buzzing. It may be down to the fact that booze and drugs are present in both, but either way everyone was having a good time! What I found most hilarious was that there is a bungee on both the famed San Antonio strip and on Zrce Beach! Now if you’re like me, you’re not the best at staying up all night but don’t panic - the parties run all day with the clubs having jumps into the sea or into pools to cool down. Then in the evenings, it’s just one big party! I would recommend hitting both Noa or Aquarius - we had a great time at both and you can chill out on the beach for some down time between the dancing. Don’t feel you need to book a hostel or hotel close to the party either, taxis run all through the night and are super cheap, it will cost you around 50p - £1.50 each in a taxi. These drivers don’t care about the rules of the road either - 15 people stuffed into a 7 seater made for slightly uncomfortable journey but was cheap as chips! Be warned though, you may want to pre-drink as I would say that drinks in the clubs at Zrce are fairly watered down. Pag also boasts some incredible scenery, the locals refer to it as a moonscape and I completely agree! It very much looks like we should be on another planet, with minimal vegetation around. It’s great for grabbing a tan, but a little difficult if you’re a ginger with a tendency to burn and need a little shade! As I keep saying with Croatia, the waters are crystal clear and great for taking a dip in - we took a range of inflatables each day and would just float in the surf so you can still cool down without the covering of trees. If you have the chance, walk or travel to the beaches a little further away, they’re much less crowded and make for a more magical day swimming and jumping into the clear water. A highlight of our time on Pag was our day quad biking. We spent an hour each way zooming along the roads to get to some of the beaches a much further away. We hopped off road for a little more excitement but it was a great way to see a little more of the island! This a really cheap and safe option to explore with so I would seriously recommend you check it out. However, just make sure you point out any problems with your bike before you leave so they don’t charge you for it later - money grabbers! My final point about Pag is that if you’re not a vegetarian, make sure you try the seafood! We had traditionally cooked octopus which was absolutely, mind bogglingly delicious. There is no way I could have enjoyed this more than I did, we got a huge sharing plate for our table of 8 that consisted of vegetables, salads, huge octopus tentacles and traditional pag island cheese (paski sir). But of course, no traditional Croatian meal would be complete without a few shots of Rakia. Rakia is a very strong alcoholic beverage that comes in a range of flavours, and is best when made by the locals. It’s also you’re cheapest and strongest drink when out so if you’re on a budget grab yourself some on ice! A UNESCO heritage site, the Plitvice Lakes National Park is a place of true natural beauty. This status was granted in 1979 and has become Croatia’s largest tourist attractions - from the pictures you will see why! Located around halfway between capital city Zagreb and coastal town Zadar, the lakes are both a must see and easy to get to. You can either do a day trip by coach, which run from towns and cities even further along than the capital, or by car so there really is no excuse not to go! The park even boasts a range of lodges and hotels for guests who really want to get involved with the wildlife and natural beauty here. The park is highly diverse, with 16 lakes which are all inter-connecting via waterfalls spanning 300 square kilometres. This was one of the highlights of my trip to Croatia, and while unfortunately I didn’t get to see any of the bears, wolves, deer or other highlight wildlife attraction that can be found in the dense woodland the park is in - it still was an unforgettable experience. This place is large, but will clear walkways and fairly accessible. You can take it as slow or as fast as you want, but I really don’t know why you would want to rush this! I think we spent around 4 hours in the park, taking in the natural beauty all around us! There are lots of routes to take, but essentially it’s hard to get lost as you do have to stick to the paths that are build for you. The best part is that they have build the pathways over the water and boggy areas, so you really can get up close and personal to these lakes and waterfalls! Now unfortunately, you can’t swim in there lakes or waterfalls as it’s protected despite the fact the water looks good enough to even drink! So if you’re going in the height of summer, know that it’s best not to go at midday as it will be boiling. Try to head over either before 9am so you’ll be coming to the end by the hottest part of the day, or start much later around 4pm. The park is open until 8pm in the summer so you’ll still have plenty of time to enjoy yourself. Also remember to take lots of water, there are a couple places to buy drinks here but, as always in tourist hotspots, you’re going to pay a small fortune for that little bottle of aqua. If you’re desperate to swim, try heading over to Slunj - a small village around 20km away. Here you can swim in the beautiful rivers surrounding the village and grab an ice cream on your way back - but be warned, the water is icy cold all year round! We also headed over to Krka national park where you can take a dip or a dive into the water to refresh after a wander into the surrounding woodland. Plitvice National park was created over thousands of years, by water eroding away at the weak limestone and chalk rocks you will find here. These kinds of rocks are really susceptible to erosion which is why the park is full of caves, natural dams and other beautiful features as the landscape has literally been carved by water. Now to have really cracking waterfalls, you have to have reasonable changes in altitude right? The park ranges from 1280m to 380m so bare in mind you will be walking up, down and all around. My top tip - wear some good walking shoes or trainers and you can thank me later. I saw a number of people stumbling around in flip flops and definitely regretting it! Some of the pathways are very slippy due to the water splashed on them by the waterfall so bare in mind you’re going to have to be careful. Photographic credit for the above slideshow - Talento Production, just click on the image to move on! The next part of my Croatian trip I headed over to the Vuglec Breg Vineyard in the Heart of Hrvatsko Zagorje, only 40km from Zagreb. I could not believe my luck when I arrived, it was the most gorgeous sunny day and the view was quite spectacular over the rolling hills. On arrival our group found a beautiful gazebo with a Croatian breakfast spread of cured meats, breads and cheeses but BEST of all, we were greeted by a table with at least a bottle of wine each to try! Safe to say I was fairly merry when I left a few hours later. I think my favourite part of the vineyard was that it was family owned. When a business is kept in the family they seriously care about your enjoyment and will always put in 110% to ensure you're having the best time. The village was carefully designed by the family owners to have a beautiful combination of wide open spaces and romantic corners so that Vuglec can suit both families, friends and couples with a number of activities such as horse riding, archery and of course, making wine! We were lucky enough that the owner decided to take us down to the wine cellar to show us around, and try some more wine of course! He told me that men who drink wine in Istra are called sommeliers, but men from Zagorje (his region) who drink wine are called alcoholics. The reason - these guys drink wine like water and they're happy for you to too! Now I know those of you who consider yourselves as serious wine connoisseurs will question how good Croatian wine is, however I found it was actually rather delicious. The vineyard produces as range of reds, whites and roses with a couple sparkling numbers in there to mix it up a bit so there is something for everyone. If you're on a budget, don't worry. If you get a group together you can visit cheaper and if you have no budget you can expect an unparalleled service from the kindest owner you could ever hope for. They also will ship wine all over the world, so if you can't get to Croatia at least the delicious wine can get to you! Croatia is THE place to be this summer it would seem with everyone flocking to this part of the Adriatic Sea. With its clear blue waters and stunning national parks, I can definitely understand why the world would want to come here. It's also more exotic than Spain, cheaper than Italy and safer than places like Turkey at the moment. So I decided to check it out for you all to find out where's hot, where's not and where is just awesome. The best way to see a country is with locals, so I hooked up with Nina who runs Oh! So Croatia to join their early August tour through this beautiful country. The trip is perfect for travellers on a budget who want to see the real Croatia; from the beaches and culture to the festivals and parties. If you want to know more about the trip (which I seriously recommend) check out my review that explains the trip in more detail and how to get involved. It's great for making new friends and aimed for 18-30 year olds who just want to have a good time. I started in Zagreb, it's a really easy place to fly into with direct flights from a lot of UK airports this year and is the capital of the country. Zagreb is full of everything a good capital should consist of - gastronomy, culture, art, architecture, music and history. There is no shortage of side streets and cobbled roads here to get lost in, all full of beautiful buildings to see and visit. The best place to start is the main square, Ban Jelacic Square (Trg Josip Jelacic in Croatian). It's the centre of Zagreb's downtown pedestrian zone and sits below the old city core with the famous Dolac Market nearby. The square has been there since the 17th century and so has a lot of beautiful buildings ranging in styles such as classicism, secession and modernism - for someone not into architecture it's easiest to say it's just very, very pretty! The centre of the square has a large statue that you can't miss in the middle which is of Josip Jalacic on a horse (excellent photo opportunity for us tourists), so you'll know you've found the right square when you get there. There were also lots of market stalls around and if you get up early enough you'll see the fruit and veg market in full swing right in the centre of the square. No matter where you are in Zagreb you'll easily find your way to the square as most of the tram services come here regularly with services running into the night. There are a number of restaurants and bars to sit in that overlook the square so grab a drink, a bite to eat or even a cheeky gelato and watch the world fly by in this picturesque setting. The next stop during your visit should be Katadrala Maijina Uznesenja which is more often referred to as Zagreb Cathedral by you and I. It is absolutely massive with two tall spires so you won’t miss it when looking out for it. If you want to head inside please remember to be respectful and take something to cover your shoulders and legs with. It’s very hot in summer so I know you won’t want to dress like a nun all day but all you need to do it pack a pashmina or scarf in your handbag and wrap it over your shoulders or around your waist so it covers down to your knees. They also enforce this rule sometimes so you may not even get in if you’re not prepared. While I was there it was being restored but it was still beautiful so make sure you find it! St. Mark’s Church is an easy find as I’m sure you can tell due to the chequered roof. The tiles were made to depict the coat of Arms of Croatia and it’s another great place to hit. First built in the 13th century it’s a stable place of worship in the city - of course a lot of changes have been made over the years to create what it is today! The Stone Gate, or Kameinta Vrata is one of five original gates that was built to guard Gradec and the only remaining one - it’s pretty cool so check it out. This is a very small museum in the heart of old town Zagreb. With over 70 full scale instruments and devices of torture that were used over the ages are to show the fear and violence found through the ages in Croatia and Europe. It’s a little creepy so make sure you’re feeling brave when you go! It’s definitely worth a visit and only opened this year so try and pop in. The Museum of Broken Relationships sounds fairly depressing, but in reality it’s quite special and even won the European Museum Award 2011 for the most innovation museum in Europe. People from all over the world have sent in personal belongings that relate to a broken relationship and a story that links to it which is then in turn displayed in the museum. In reality it’s awesome and just trust me when I say to go! For those of you who like to party, this is the street in Zagreb to get to. It’s clean, safe and a great place to meet the locals during a night out. Croatians are such great people and speak such good English so make sure you get to know some of the locals. Tkalciceva also has good cafes and restaurants so if you’re not sure where to grab a bite to eat check here first. Strossmatre Park was a really lucky find within Zagreb which I literally stumbled across. It's got a few benches and tables which offer the best view of the city from above. There is also a number of street vendors who sell food, drinks and souvenirs so that you can relax with a nice cold beer and a local Croatian dish while watching the sun set over the city. 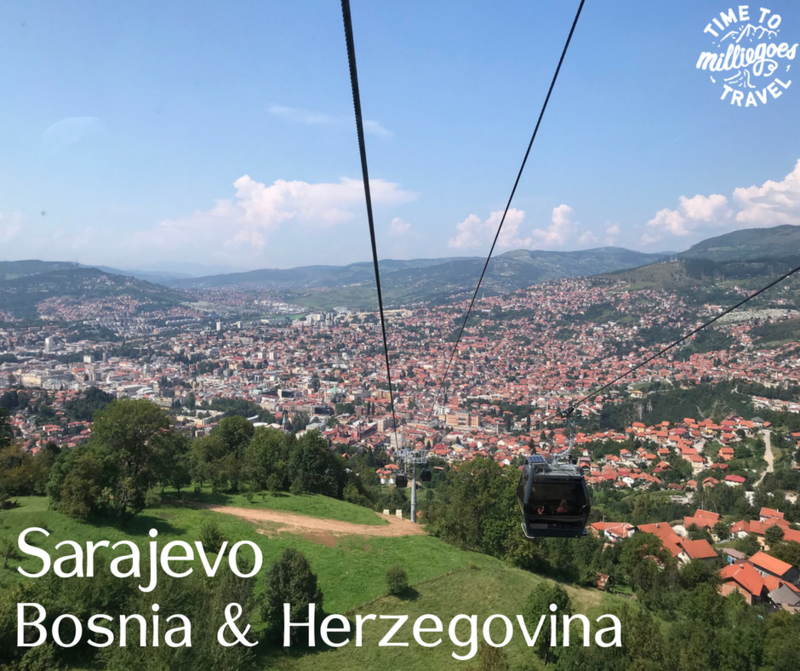 For those who don't want to climb the streets of old town to get here, there is a cable car that will take you up for a couple kuna. There will be other places definitely worth visiting but unfortunately I only had half a day here and I don’t like to give advice on things I haven’t done! Let me know if you’ve been to Zagreb and can recommend anywhere for me to add.